I have decided that the auto settings do a better job of photographing paintings than I do manually. This was taken with a 28mm manual focus lens, and the 'landscape' camera mode. That's a terrific picture. So much characterization. Of course, since I have a personal thing for roughneck little boys I love Celegorm dangling upside-down! Nice concept for the harps also. Those would work. I feel a thing like that is something you could reasonably carry in a backpack. Apparently they are quite good about staying tuned for a couple of weeks, too, you don't need to constantly retune them. They seem to be having a good time, as well they should. It's good to see a summer scene, and the tree looks most treeish and texturey. I'm lookng forward to exploring the Anglo-Saxon site. I enjoyed the little harp video. But it is fascinating to hear the sound of an instrument so old, even if the music is a guess and I would guess perhaps a number of the construction techniques too. I love this. Fabulous arrangement, and wonderful forest light! Thank you! Still not quite as I would wish, but moving in the right direction, I think. This is a very interesting thing, a Myanmar harp, which I saw and heard played recently. THe modern version has tuning pegs, but the original uses a complicated system of knotted string. Ooh, that does look complicated to tune! I wonder what the strings are made of, they don't look like the usual synthetics. Cotton, usually. The main body is wood, but the bit on top that forms the soundboard is deer-skin or ox-hide. Because of course a tree is where a music lesson should be. 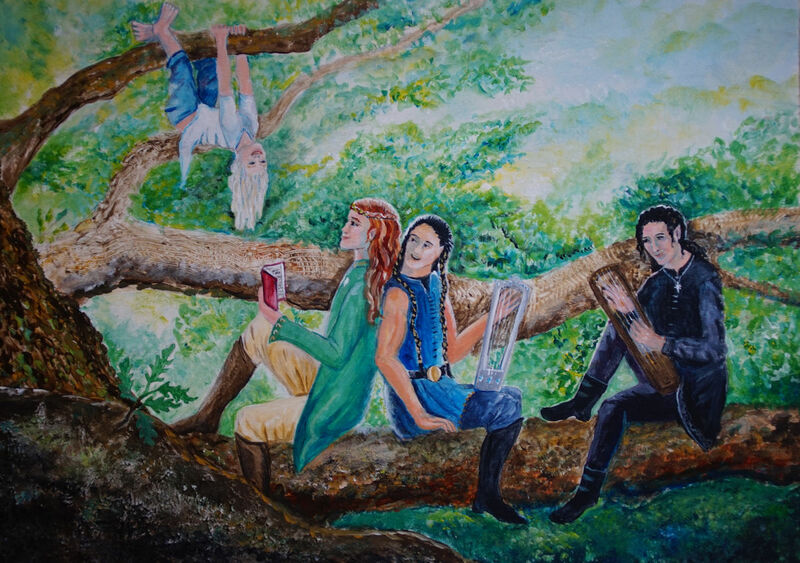 I wonder how elves think of childhood - is it something that passes over for them the way a brief illness might for us? I think Tolkien elves are supposed to have quite long childhoods - a hundred years or so - but their minds grow faster. Probably they don't have a spotty awkward adolescent phase, the bastards! All of it, but especially how Fingon is turning around and his expression. Just coincidentally, I came across the set of relevant Quenya words yesterday, the words for harp, little harp, harp music. 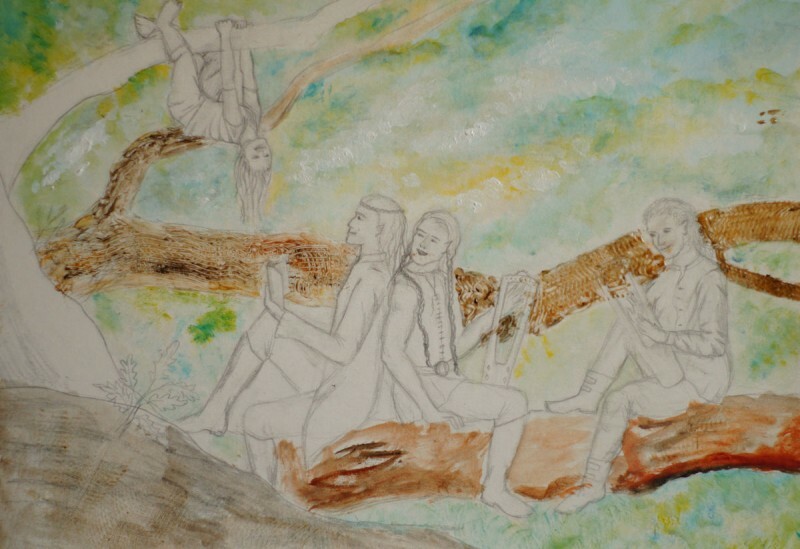 I have in mind to practice my figure-painting with a series showing each of Finwe's grandchildren showing up (I had to make up the order since we only get birthdates for half of them of course.) The next are Turgon & Finrod, who do seem to have birth dates and I had not realised were born the same year. If I do this, the last one will be of them both standing in two groups glaring while in the background Feanor holds a sword to Fingolfin.